Read here about tensegrity structures composed of thirty struts, part of a series of pages organized by strut count. 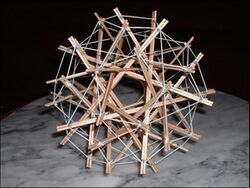 The classic 30 strut tensegrity outlines the form of a regular icosahedron. caption="30 strut stellated dodecahedron by Adrian Rossiter. This page was last edited on 23 September 2018, at 12:35.